Obsessed foodie, that’s my guy’s cousin Mitch. He graduated from a professional chef program but then decided he didn’t want to work that hard. When he’s not shopping in Chinatown or the Union Square Greenmarket, he’s cooking. Every other moment of most days, he ranges the chat rooms at eGullet.com. Mitch and his wife Alison just got back from five days in Bologna with side trips to Padua and a visit to a friend’s restaurant in Umbria. They didn’t go to the guidebooks’ most highly rated and expensive Bologna places and skipped Trattoria Caminetto d'Oro, “No matter what the books are saying.” Ditto Il Bitone, Da Cesari, or Diana. He is an unabashed penny pincher. I’m saving his tips for my trip. Thought I’d share where a pro like me gets ideas. Trattoria Meloncello (via Saragozza, 240/A Ph. 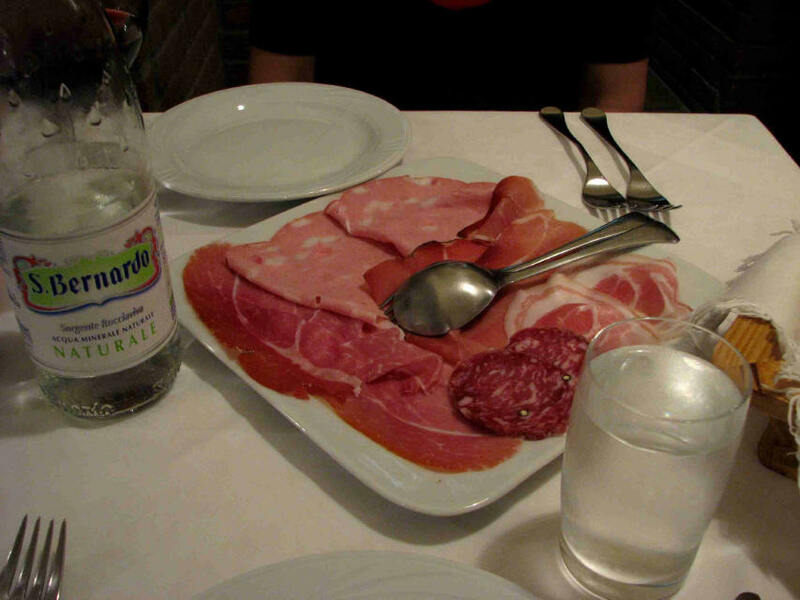 051 614 3947), a small, Slow Food place at the foot of the San Luca climb. No written menu, but a great, homey feel with a large garden. Daily specials recited in English - just English enough for two NYers. The best tortellini I've ever tasted, in a wonderfully flavorful brodo. Delicious polpetti. For dessert, I had spotted a bowl of peaches on the counter and asked if I could have that - so they took a couple of peaches, peeled 'em, sliced 'em and tossed them with sugar and a bit of grappa - a great way to finish this classic Bolognese lunch - all for under 50 euros. Meloncello was our favorite... it’s a must. Ristorante Montegrappa da Nello (via Montegrappa, 2 Ph. 051 236 331) We really had fun here, thanks to another eGulleteer for the recommendation. Fun place, friendly, English/French speaking waiters, quite a number of tourists, but worth it for some well-turned versions of a couple of classics - here's where I bit the bullet, going for the bollito misto. (I couldn't even take the pic without first tasting!) 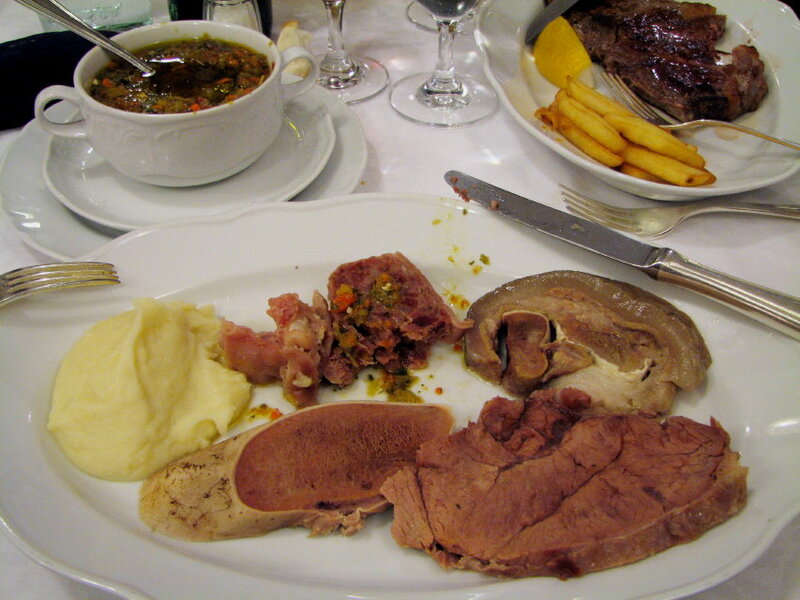 It's head, trotter, tongue and some other cut - breast, perhaps - served with a great salsa verde and mashed potatoes. Delicious. Il Tari (via Collegio di Spagna, 13 Ph. 051 226 046) In the group of shops right under our rental apartment was this little place, calling itself both a pizzeria and trattoria. We dined on splendid pizza (the pizzaiolo was Pugliese - the chef was southern) as well as great squid, delicious pastas and salt-baked orata. Liked it so much we ate here twice. Trattoria Gianni (Via Clavature, 18 Ph. 051 229434) We thoroughly enjoyed our lunch here, enough to go back for dinner. Recommended dishes include pappardelle with a lamb ragu and veal with porcini mushrooms; the affettati misti is not to be missed. Essential to reserve for dinner. Il Gelatauro, (via San Vitale, 98/b) Amazing gelato via Sicily. Grom (via M. D'Azeglio,13) was good too. They now have a NY outpost on the Upper West Side. We took a day-trip by train, about 90 minutes each way. We saw the Giotto frescoes at the Scrovegni chapel (reservations a must), and then went to Veranda Il Calendrino (Via Liguria,1, Sarmeola di Rubano Ph. 049 630303) for lunch (part of the Le Calendre family of restaurants). It's a 15 or so euro taxi ride outside of town, and their set lunches for 20 and 30 euros. Their memorable bread basket included taralli, unsweetened round semolina cookies, that are boiled, then baked - Italian bagels? Our first course was the cicchetti sampler - some classics, with others showing a contemporary spin (deep-fried pork belly). 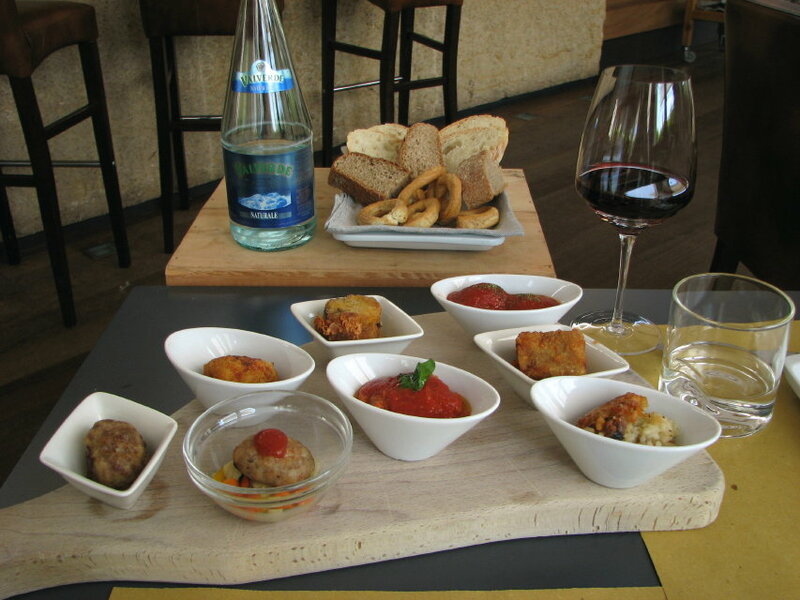 There are a couple of varieties of meatballs -- one stuffed with a creamy cheese from the Veneto, another served with a luscious tomato sauce, as well as "pappa al pomodoro," tomato and bread soup. Next up for me was filetto of beef, while Alison had the pasta of the day, strozzapreti, or priest stranglers, served with a very rich Bolognese ragu. And yes, the pasta was almost red; sometimes the egg yolks are actually red. Finally, for dessert, we had the sampler: ten delicious pastries, some complex, some simple, all stunning to look at and devour. Our lunch for two was 80 euros compared to tasting menus of 175, 185 and 219 euros at the mother ship. Erba Luna (Via San Albertino, Ph. 075 930 6405) Montone, Umbria. Our friends Judith Klinger and Jeff Albucher, NYers who own a house in Montone and live there 9 months a year, decided to open a restaurant in the Parco delle Rimembranze. Over three nights, we tried nearly everything on the menu. One of my favorite dishes was the zucca gnocchi - cloudlike gnocchi - with celery sauce. An artichoke soufflé came out of the kitchen puffy, golden brown, fragrant and disappeared in two minutes. Awesome assorted antipasti platter (a great lunch by itself with some of Judith's wonderful bread), as well as a fabulous insalata with sautéed porcinis that my wife and I fought over. A couple of standout pastas included Judith's hand-made maltagliati (badly cut pasta) with a 5-nut pesto, and another with bottarga and grilled gamberini that was briny, funky, messy and absolutely delish. The one risotto on the menu (made to order) included gorgonzola, walnuts and grapes - perfectly cooked, the flavors worked beautifully, and the walnuts added a nice textural surprise. Moving on to the secondi (here's where my memory starts to fail, by now I've had a few glasses of wine), I had a great rack of lamb crusted with pistachios - order it rare. We dug deeply into the fried codfish and artichoke dish - it was lightly battered and the equal of any we've had in Rome. Pork tenderloin was also tasty and juicy. I remember even less about the desserts - we're usually too full to worry about them. The wine list has some nice surprises from Umbria (at ridiculously low prices), and delves into a few other Italian regions as well. And all meals start with Prosecco, offered on the house, but it's not a bad idea to start with a cocktail in the lounge.